Kratos was born to a Tethe'allan aristocratic family around 900 years after the start of the Kharlan War. By the time of his birth, the battles between Tethe'alla and Sylvarant had become an everyday occurrence. At some point while growing up, he joined his kingdom’s knighthood, rising up to the rank of captain serving Tethe'alla’s princess Soleil. He and the princess developed feelings for one another but Kratos wasn’t of a high enough status socially to consider a serious relationship with her and she announced a marriage with someone else. After Kratos instructed the pair on how to properly present themselves when in audience with the royalty, they presented their case to the king. The king, however, refused to listen to the two purely on the basis that they were half-elves, and Kratos was disgraced for aiding the siblings. Soleil also refused to listen to him. She spoke harshly of the siblings and decried Kratos’ actions as heretical. Not willing to give up, Kratos then made arrangements to negotiate with the Sylvaranti military officer, Yuan, in a final attempt to make Sylvarant call off the attack. Kratos, Mithos, and Martel continued to travel together and eventually were joined by Yuan after he was disgraced and chased out of his country. He only followed them with the intent of proving them wrong. Yuan would regularly start one-sided fights with Kratos but the two would grow to be good friends. Kratos also discovered Noishe while traveling with them, wounded and in need of help. Adding yet another friend to the group. Later on, Martel would take Kratos aside to request that he watch over Mithos. She told him that her brother had difficulty understanding and relating to other people. She knew that Mithos trusted Kratos, and wished that Kratos would do everything he could to guide her younger brother and help protect his fragile heart. The group, by then known as the four heroes, managed to bring an end to the Kharlan War. Although the war itself was over, the world was still in danger of running out of mana after mana exhaustion caused the Giant Kharlan Tree to die. To prevent the world from running out of mana entirely, Mithos split it into two to wait out the decades it would take Derris-Kharlan to return on its 100 year orbit so its mana could be utilized to germinate the Great Seed. Just as Derris-Kharlan was approaching, Martel was killed as she tried to protect the Great Seed from humans who wanted to monopolize its mana. Her last words, “I want to see a world without discrimination,” were misinterpreted by Mithos, which lead to the founding of Cruxis and his plan for an age of lifeless beings. Kratos never approved of the Chosen system, even with Mithos concealing many details of the Journey of Regeneration to him. After seeing how multiple Chosens suffered and died, Kratos tried to make an appeal to Mithos to find another way to create a body for Martel. This led to the creation of the automaton Tabitha. She was a failure as a vessel however, and the project was eventually forgotten. Seventy years before Colette’s Journey of Regeneration, her Great Aunt Aithra went on her own journey. Kratos accompanied her along with her priests. Aithra was expected to fail and nobody at Cruxis even gave her the dignity of taking her journey seriously. On the third trial Aithra’s bond with the Cruxis Crystal failed and she lost her mind, after which the priests had to tie her up and drag her to the next seals with ropes. At the final seal, Kratos retreated to Welgaia where he could view the proceedings on a monitor along with Yuan, a rarity for him as he despised the ceremony. He watched as one of the priests who had accompanied them, who turned out to really be a half-elf whom Aithra had rescued while she was still herself, rebelled against the rest of the group and Remiel and attempted to save her. Seeing the young half-elf fight for her, Aithra regained herself for an instant and took a fatal blow for him. After the Chosen died, Remiel killed everyone. Mithos had walked in during this as well, and upon seeing how both Aithra and the young half-elf had been slaughtered could only think to say “cleaning up will be a pain”. It was at this moment Kratos realized he no longer recognized Mithos for the person he was anymore. Aithra’s death had been so much like Martel’s Kratos was in disbelief that Mithos had not made the comparison. It was this event that spurred Kratos to leave Cruxis and descend upon the surface. It was decades before anyone in Cruxis became aware of Kratos’ whereabouts again. By then he had begun traveling with a human woman named Anna Irving. He had rescued Anna from Kvar’s ranch at some point beforehand. Meeting Anna had made Kratos realize that he had made a mistake in accepting Mithos’ ideals and that he had to right Mithos’ mistakes. Eventually the two fell in love, Kratos even removing his Cruxis Crystal during the time spent with her. They lived as vagabonds constantly pursued by Cruxis. As they traveled from place to place, Kratos began to search for a way for a human to wield the Eternal Sword. Eventually, they got married and Anna gave birth to their son, whom they named “Lloyd”. One day, a Desian resistance group that Kratos and Anna were allied with came to warn them that Kvar had figured out their location. Kratos decided that it was time to put his plan in motion. He would take Anna and Lloyd to Iselia where they would be safe from the Desians and leave them so he could kill Mithos. He never told Anna anything about his plans to abandon her and their son or that he was going to let himself be killed to release Origin’s seal. As they neared their location, Anna continued to the village with Noishe and Lloyd while Kratos left for the Tower of Salvation in pursuit of another lead. He’d been informed that the resistance group that helped them before had made a move on the tower. Once he arrived he realized that the info was merely a trap set up by Kvar to capture him. He managed to escape with Yuan’s help and learned that Kvar was on his way to Anna’s location “to retrieve his Angelus Project”. Kratos rushed to Iselia as fast as he possibly could, pushing all of his angel functions to their maximum level. By the time he arrived in the woods that Anna had fled to she had already been tracked down by Kvar and his men had removed her Exsphere. Lacking a key crest, her bodily mana went haywire. She had transformed into an Exbelua and was out of control. Anna attempted to attack Lloyd but was intercepted by Noishe, wounding both Noishe and herself. Anna momentarily regained control of herself and begged Kratos to kill her; losing control once more and attempting to attack Lloyd once more. This time Kratos reacted, cutting off her arm and kicking her down a cliff. After that Kvar attacked, and Lloyd fell down the cliff-side, along with Noishe, while clinging to his Mother’s Exsphere. Kratos eventually managed to knock Kvar out and fly down to the base of the cliff to search for Lloyd. All that he could find were pools of blood and half eaten bodies. Kratos convinced himself that Lloyd had died. Everything felt meaningless to him after losing his family. He returned to Cruxis and destroyed the Eternal Ring he had worked so hard to find with Anna. As long as the worlds were reunited Kratos felt that would be enough. Shortly before Colette’s journey was to start, Mithos approached Kratos and demanded that he protect the Chosen. Colette was an even better match than Spiritua and had a very high likelihood of being a successful vessel. Kratos protested, stating that he had to command Pronyma and do his job as the Sylvarant supervisor. Mithos said not to worry and that he would take care of those tasks himself so Kratos could just focus on protecting the Chosen. Doing as he was told, Kratos descended to the surface under the cover of being a mercenary. Absolutely nobody in Cruxis had any idea that Kratos would be going. This was the first time he’d been ordered to protect the Chosen from the time she received the Oracle until she made it to the Tower of Salvation. Pronyma was not informed of the changeup until Kratos did not arrive to his meeting with her. Yuan found out after Botta sent back a report of encountering him at the Temple. When Kratos saw Anna’s grave and realized that his son was still alive he began to hope again. However he soon began to realize that Lloyd’s frame of mind about the state of the world was no different from his own. Lloyd believed everything would be fixed if the World Regeneration was successful and thoughtlessly entrusted everything to Colette. It was no different from when he himself had seen Mithos as the hero who would save them all. Later on, Kratos was confused as to why Magnius wanted to kill Colette at the Palmacosta Human Ranch. At first Kratos thought Yuan might be involved. He’d been aware that Yuan was the leader of the Renegades for hundreds of years, but he never had trouble keeping it to himself because Mithos wasn’t interested in them. But nonetheless Kratos couldn’t see Yuan putting himself at risk by revealing his involvement with the Renegades to a Grand Cardinal. Kratos realized that someone else in Cruxis must be plotting something. Kratos decided the best thing to do for the moment was to make Lloyd hate him as much as possible. He felt that Lloyd hating him would help Lloyd grow stronger and find some way to survive. He failed to convince Mithos that he was serious about defeating Lloyd however and Mithos came down to finish the job himself. Kratos hadn’t been expecting this to happen. He seemed to submit himself to Mithos’ wishes at this point, but was actually planning to attack him. He made a quick assessment and decided that if he attacked Mithos just as he was about to unleash a spell to kill Lloyd, he would be able to get the upper-hand. Just as he was about to move the Renegades came in and distracted him, taking Lloyd and his friends with them. Kratos was relieved by this and began to plan his next step. While catching up on the paperwork that piled up in Welgaia while he was busy with the journey, Mithos came to visit Kratos in his room. Cruxis already knew from a scan from when Colette first entered the Tower of Salvation that she was suffering from Chronic Angelus Crystallus Inofficium. However the cure had been lost long ago and Colette was useless as a vessel while ill. Because of this Mithos tasked Kratos with locating Altessa. Afterwards, Kratos went to tell Yuan that Mithos needed to see him, managing to find him while he was attempting to capture Lloyd in the Fooji Mountains. Sending Yuan away, Kratos turned his focus to Lloyd asking what he planned to do. Saving the Chosen would not change anything about the world and Lord Yggdrasill saw no fault with its current state. Kratos told Lloyd that if he wanted things to change he’d have to use his head. After the confrontation at the mountain, Cruxis was able to track Colette’s mana to find her when needed and decided to let her be for the moment. Kratos couldn’t understand how she managed to recover her soul however and went to ask Yuan about the issue. Yuan explained to him that Lloyd had made a key crest for her that seemed to work, but Kratos insisted that simple key crests are not sufficient for use on a high exsphere. Yuan pointed out that Lloyd’s simple key crest works just fine on his own high exsphere and Kratos reminded him that Lloyd’s exsphere is experimental and that the circumstances weren’t the same. While there Kratos became acquainted with the half-elves Kate and Schneider. Talking to them he learned that the Pope had his own Angelus Project underway in Tethe'alla and Altessa’s location. He would come and go from the research academy for a while to repair a machine from the Kharlan War that was rumored to have been used for adamantite production. He eventually got it working again, finally producing the adamantite, causing quite a stir in the academy in the process. From there on, Kratos sought out Altessa and began a discussion with the Dwarf. Their conversation was interrupted when Kratos heard the flapping of dragon wings and a run-in with Pronyma while trying to locate the source. There Kratos found Pronyma who had been tracking Rodyle and the two exchanged information. Kratos learned that Rodyle was the one responsible for Magnius’ betrayal and the Pope’s Angelus Project. Kratos knew that if Pronyma went after Rodyle she would probably try to reclaim Colette as well, ruining his current plans. To avoid this, Kratos told Pronyma to leave Rodyle for the time being and go report to Mithos about Altessa. Kratos was discouraged by Ozette’s destruction but thought there may still be some sacred wood stockpiled in another location. He sought out Lloyd’s group once more to question Presea on the matter. She informed him that all the wood that she had previously gathered was in the Meltokio church. After getting the information he sought out, Kratos warned Lloyd that the pacts were a bad idea and that he needed to be patient, knowing that their efforts would get them nowhere without the Eternal Sword. He was interrupted when Pronyma came to him for assistance. She had run a model on the Cruxis Core system to predict the outcome of the mana links being severed which had shown it would lead to the destruction of both worlds. She had tried to inform Mithos of this but he said he didn’t care. Kratos was stunned that Mithos showed such apathy to the situation and Pronyma snapped at his reaction, shouting at him “Whose fault do you think it is that he became like that!?”. Kratos agreed with Pronyma’s plan to rendezvous with Lloyd’s group at the Mana Tower in order to stop their pact with Luna. Before leaving he requested that she order the other Grand Cardinals to attempt to stop Lloyd as well. Pronyma said she would try but Forcystus was the only one who was still alive. Kratos seemed confused and when he asked what had happened to Rodyle she replied “I gifted Rodyle with the means of death all traitors deserve”. He attempted to stop Lloyd’s group from forming a pact with Luna at the Tower of Mana, but then Yuan came in and ruined everything. When the Great Seed lost its protection from the mana links it turned into a rampaging twisted tree that caused a massive amount of destruction in Sylvarant. Suddenly they heard a noise nearby and discovered that Kate had overheard the whole conversation. Not wanting such sensitive information to reach Lloyd’s group, Mithos ordered Kratos to capture her and take her to Welgaia. Kratos complied and took Kate with him back to the Cruxis stronghold. While on Welgaia, Kratos made arrangements to ensure that Lloyd would be able escape to escape with all of his friends and obtain a mana shard for Colette’s treatment. He placed a sensor in the jail cells they would be kept in to notify him when the group broke loose and sent the guards off to other tasks. After capturing them, he then went to free Kate and had a discussion with her about how he met Mithos and his hopes for Lloyd. After being injured at the confrontation at Altessa’s house, Kratos regained consciousness in his room back on Welgaia. He had been locked inside with a guard posted to keep watch to make sure he stayed put. Kate knew he would need help though and she had the Renegades sneak her into Welgaia. Once there, she pretended to be a Cruxis Crystal researcher who had urgent business with Kratos, claiming that Yggdrasill had requested that she fetch him. Once Kratos was out it became apparent that word of what had happened hadn’t spread to the other Angels, the pair being able to go where they needed with ease. They headed towards a communication room where Kratos contacted Zelos, who was in Flanoir at the time. He told Zelos that he needed help with retrieving a piece of Aionis for Lloyd. Kratos couldn’t access the ore himself because he would be caught. Zelos seemed conflicted by the proposition and had to cut off the transmission before giving a confirmation. Kratos told Kate that Zelos was no idiot and that what happened now depended on how much he cared about Lloyd. Zelos would later get back in touch with Kratos and agreed that he would find the Aionis because he was the only one who could. The two stayed in the area until Lloyd’s group defeated Mithos. 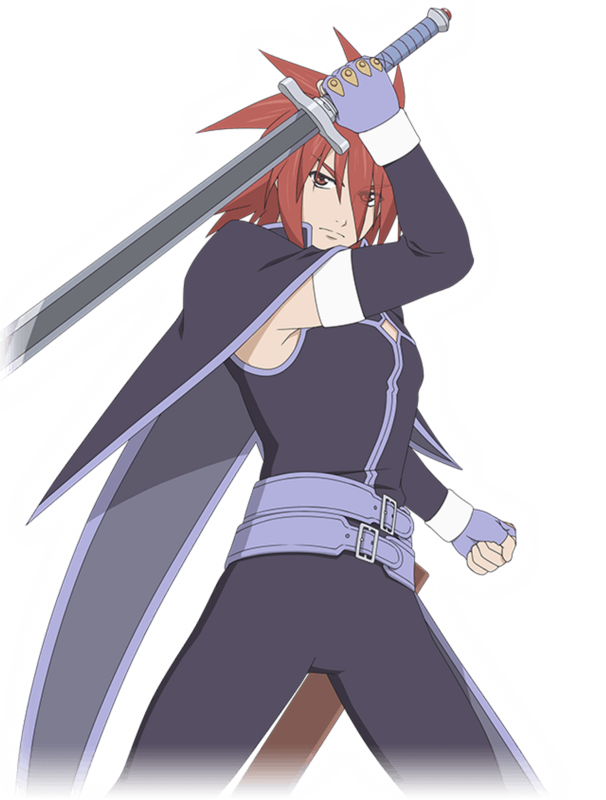 * With Mithos gone, Lloyd had made the decision on which path Kratos should take, a decision he felt he was too much of a coward to make on his own. After the fight was over, Kratos approached Lloyd stating he would be waiting at Origin’s Seal. He then left for the surface with Kate. Yuan was waiting for them outside and Kratos informed him that Mithos had passed on**. Kratos told Yuan that it was the two of them who had lured Mithos down the path to destruction, Yuan agreeing. Kratos then requested that Yuan see Kate back to Ozette so that he could make for Origin’s Seal. The three of them began to talk about Mithos, Kratos stating that he believed that Mithos wanted to wait for a moment of rebirth, to do things over again. When Yuan questioned what Kratos was planning to do, he replied that he regretted he could neither save Mithos nor fall together with him. He’d left the task of killing Mithos to Lloyd while he himself did nothing. Yuan tried to say he was the same, but Kratos disagreed and told Yuan that he at least had upheld Martel’s words. Kratos said it was time to bid farewell to the past. Over the four thousand years of his life more people than there are stars in the sky had fallen victim to Cruxis. He had stood by while his dear friend and student had become the greatest mass murderer in history and a part of him deep down still agreed with Mithos’ decisions. Kratos felt that for a person like him, who had stood by Mithos, to suddenly follow Lloyd after Mithos had died would be selfish. It would not change what he had done. Kate told him Lloyd didn’t think of him like that, but Kratos shot her down stating he couldn’t forgive himself for not making a decision on what to do. While Lloyd was the one actually changing things Kratos had simply folded his arms and watched, and for that he deserved the same fate as Mithos. Kate disagreed once more, saying that he was expecting Lloyd to shoulder the sin of patricide. Kratos told her it was true that he was Lloyd’s father, but at the same time he was also Mithos’ kindred spirit from four thousand years ago and his relationship with Lloyd didn’t change what needed to be done to release Origin. Kratos felt his death was a essential element for Lloyd’s success. “I am… a human of the past. I have a duty to settle the past and entrust the future. Those who should walk together with Lloyd towards the future are his friends, not me”. At Origin’s Seal, Kratos thought to himself that this fight was ultimately nothing more than his own sentimentality. But he believed that when Lloyd surpassed him it would be symbolic of the future winning over the past. As a friend of the former hero Mithos and as a father he would fight at his best, bidding Lloyd to come at him with everything he had. Kratos was defeated and subsequently had his life saved by Yuan. Lloyd told Kratos that his death wouldn’t accomplish anything, to which Kratos agreed voicing regret over his son having to teach him something so obvious. Just then Origin emerged from the seal, resisting the idea of aiding the group in obtaining the Eternal Sword. Kratos told Origin that they both had agreed with Mithos’ ideals at one time, feeling that Mithos’ way was the only option they had. Kratos said Lloyd was different though, Lloyd had shown him that in order to change something you must do it yourself. It wasn’t enough to just rely on others and their decisions. Origin stated he would attempt to put his trust in people and allowed the pact. At the moment, Mithos, whose consciousness was contained in the Cruxis Crystal Genis had picked up, attempted to take control of Lloyd. One of Lloyd’s friends took his place and Mithos warped away in their body, collapsing the Tower of Salvation as he went. Once the ring was completed Kratos collapsed, still wounded from his fight with Lloyd. Kratos told Lloyd he doubted he could help him anymore and gave his son his sword, the Flamberge, to aid him on the mission to stop Mithos. Dirk also gifted Lloyd with a sword, the Vorpal Blade, the finest sword he’d ever crafted. Lloyd expressed his gratitude to both of his fathers, Dirk who had crafted the ring for him and Kratos who had protected him in secrecy. With that the group set off. Kratos stayed with Dirk while they were gone and discussed their son. Dirk praised Kratos for his determination and being able to change his way of life so dramatically. In return Kratos thanked Dirk for raising Lloyd to be such a pure and honest man, the person who had helped him changed. Dirk said he didn’t need to be thanked and that they were both his father. Not long after the world was regenerated, Kratos requested that Lloyd send him to Derris-Kharlan along with the surviving members of Cruxis. This was so they could atone for what Cruxis had done, make things easier for the half-elves not affiliated with Cruxis, and allow for Kratos to disperse the Exspheres on Derris-Kharlan into space. After bidding farewell to his father, Lloyd reluctantly sent Kratos to Derris-Kharlan with the other survivors of Cruxis. Kratos said his final goodbye to his beloved son and Derris-Kharlan once again began to wander space as a comet. Kratos was the new leader of Derris-Kharlan, on a search to find a new home for the former members of Cruxis. The journey itself was a form of pentance for the role in twisting the world. Things there were uneventful but Kratos noted that the other people there were having trouble finding a place to go. Kratos also secretly kept in touch with Yuan for two years after leaving, the two informing one another of the happenings at their respective posts. Kratos began to think back on his travels with Mithos and the other and suddenly recalled the spirit of the deceased Kharlan Tree, Ratatosk. Kratos wondered if the spirit still lived somewhere in the world even when the former tree had been dead for ages. Yuan stated it was possible and that the issue needed to be looked into immediately. He noted that if that was the case, however, they would have to get Lloyd involved once again due to the blessing bestowed on him by Martel. After some time Derris-Kharlan reached the limit of the communcation range. Knowing this, Kratos and Yuan made a final call to one another. Yuan made sure Kratos was sure he didn’t want Lloyd to know, which Kratos confirmed “My place is in the Past. I’m counting on you to look after the World Tree” he said. Before the transmission broke they bid farewell to one another as friends, and Derris-Kharlan continued to wander the vastness of space. He doesn’t know what Noishe’s gender is. His Japanese VA Fumihiko Tachiki voiced Gendo Ikari in Neon Genisis Evangelion. At least 3 of the Japanese Kratos novel reviews that I read said that Anna should divorce him. The long lower layer of his swallowtail cape on his default outfit was going to be white originally. It’s still white on the world map when he’s riding a Rheaird. His room on Welgaia is soundproof. Before he left Kratos advised Lloyd and his friends to keep their Exspheres equipped for a while in order to protect the new World Tree. I’d note that the resolution of DotNW mostly resolved the issues that required that. Kratos really didn’t like that Remiel pretended to be Colette’s father. Since his Cruxis Crystal has a key crest he has full control over many of his bodily functions, such as adjusting his 5 senses at will. He turns his hearing off when people are saying things he doesn’t want to hear on multiple occasions. Kratos had begged the Elven Elder to give Lloyd the mana leaf herb to help cure Colette. When the Elder explained what happened later Kratos seemed flustered, literally blushing when Lloyd thanked him. Kratos was really happy Lloyd invited him on his future boat trip and that Dirk raised his son to be such a good person. When Kratos told a Sybak scholar his name the scholar told him “There are records of a guy with the exact same name who was a knight during the Kharlan War. Are you a descendant or something?”. Mithos doesn’t like how plain Kratos’ room is and tells him “I’m not saying you should imitate Yuan, but you could still decorate a bit”. *Kratos’ Flanoir scene didn’t happen because I added DotNW. He sticks around with Kate until Lloyd’s group came to the Tower of Salvation. Other events were skipped because I’m doing a full Cruxis article and some things are more relevant to other characters. Don’t want to repeat myself over and over. **Mithos didn’t actually die there he faked his death. He sent his body to Derris-Kharlan and left the Cruxis Crystal containing his conciousness for Genis to find.